I decided a long time ago that I would never get too personal on here, because when one does that there’s the potential to make oneself vulnerable to insensitivity or unwarranted criticism (which can be warranted in some cases, of course, but I don’t want to talk about that right now), or to be misunderstood, and I’m just an ordinary person trying to live my life. Quietly, for the most part. But I went through something heartbreaking this week, and I’ve been feeling so alone and so miserable that through the tears I can see the benefit in sharing the events of this past week with others, in the hopes that good may come out of it. Even if it comes between posts about products. I’m sorry about that. 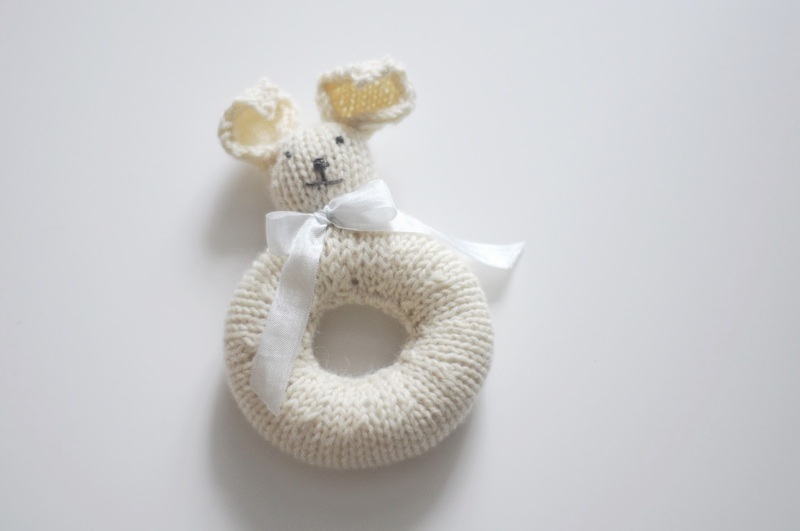 I made this little bunny rattle for the baby Geoff and I were to welcome in late August, but something went wrong along the way and I suffered a miscarriage at nine weeks (sorry, friends I never got to tell, but that’s why I wasn’t drinking at your parties months ago). It’s brought a sadness so profound I’m actually surprised by it, and a physical pain so intense that Geoff nearly called for an ambulance when he found me writhing on our bed. With it went my excitement, my daydreams that imagined my life gliding along a trajectory to a potentially happy future that had seemed elusive. And now I’m mired in feelings of hopelessness, uncertainty, fear, guilt. I had tried so hard not to get ahead of myself, leaving that soft, tiny one-piece with bear ears that was on clearance on the rack, not buying black and white, high-contrast stuffed animals when I saw them, only sharing the news with a handful of close friends and family. I knew that this could happen, that it happens so, so often, and is sometimes far worse (not that this is a competition… wouldn’t that be the most hateful competition of all time) but now I have to deal with the brutal outcome for real. With a possible D&C. With the devastated would-be first-time grandparents. With returning the small tower of pregnancy books and prenatal workout DVDs to the library and signing out the books I never wanted to read. Sometimes I feel fine, and sometimes I lose my breath and the tears come hot and fast and I can’t get it together, even on the subway, and it’s just despair and hollowness. A few years ago someone I wasn’t particularly close to posted a photo album on Facebook. The photos were of floral arrangements, with notes of thanks to the friends who had sent them, and sympathetic yet vague responses from some of those friends. There was no hint as to why they had been sent, but I had the feeling that they had been sent because she had had a miscarriage. I may have been wrong, but I remember thinking that that was a sweet thing that people did for each other, that because no one can actually do anything to help (what can they do? Friends have asked and I don’t know the answer), they resort to a tried-and-true, kind gesture. I remember thinking that she posted that photo album as a way of crying out that this was a thing that had happened to her, that she was grieving and desperate for acknowledgement. Which may be what I’m doing here. And yet hardly anyone wants to talk about it, which I understand, I understand so well! I certainly don’t see one miscarriage announcement on Instagram for every three or four pregnancy announcements (one in five or one in four ends, I get different stats quoted at me). Imagine how many followers you would lose! This might sound silly/crazy, but I will take what little I can get where I find it: I recently finally downloaded the newest Beyoncé album. The video for “Blue” was so touching and warm to me that I cried. A few days later, while crying for different reasons, I listened to Jay-Z’s “Glory” and watched the HBO documentary Life is but a Dream. In it she talks about how she had had a miscarriage before Blue Ivy was born, and she talks quite a bit about how painful it was for her. I am no Beyoncé, and I have a net worth of maybe the total amount of spare change in just one of her purses (as if Beyoncé even touches paper money and coins with her own hands), but it made me feel connected to her, and oddly, shockingly comforted. She mentions that her grandmother lit candles in churches for her mother, and her mother lit them for her; I haven’t been a practicing Catholic since I was a child, but it’s funny how in times like these I get the compulsion to light a candle in every church within a 20 kilometre radius. On the day in December that Geoff and I found out that I was pregnant we bought lottery tickets and took photos in one of the few existing analogue photobooths around here. We felt so lucky. A bit scared, of course, but relieved, and so full of love. And this week, only a few weeks later, my life turned into a surreal nightmare in which I sat in a chair in a downtown hospital’s emergency room waiting and waiting and waiting for a RhoGAM shot. A few feet away behind a thin, pale blue curtain a nurse asked a patient inane question after question about her life, making her recite phone numbers and addresses, trying to keep her alert and awake and to bring her back from the brink after she had tried to kill herself with an overdose of pills. It was harrowing. I still haven’t been able to process that. I don’t want to be known as that woman who had a miscarriage (oh god! ), and I don’t want this to be seen as a tragedy that I will let colour the rest of this year. It is only January, after all, and the best parts of the year have yet to come (this has been a particularly frigid, dreadful January). But for now I’m shivering, lying under blankets in my apartment that is barely above freezing because our furnace broke overnight, feeling that the universe is adding insult to injury. I can only hope that the universe will grant me a future will containing even a hint of the happiness and beauty in that “Blue” video. No words can adequately express how sad I am to read this news. You have suffered something terrible and are so brave to write it here. Sending hugs to you sweet Anabela. The best is yet to come, for sure! Bless you with love :) big hug! Sending you love. So much love. I always wonder about the instructions to keep pregnancy a secret - sure, if you don't tell someone happy news you don't have to tell them sad news. But how isolating must that be. so very many virtual hugs heading your way. Where there is darkness there will be light. I send you so much love in this very difficult time and know that it is okay to take your time with grieving. I've sat here typing, deleting and retyping for about ten minutes now. I don't feel anything I could share would identify with your loss, but I just hope that telling you, you're not alone, you will be happy and strong again, and that time really does heal all - I know you'll always remember what could have been. Try to take the grief forward with you, let it shape you and your love for others. I am so sorry for your loss. I'm a stranger/customer/admirer who doesn't know you but I'm truly sorry. I have seen friends go through miscarriages and stillbirths while I hang idly by, helpless and ignorant as how to console or help in any way. I hope the season warms and the weeks get brighter for you. OH Anabela! I'm so sorry to hear that. It does feel like the coldest january I have experienced in a long time. Your words made me cry. I haven't experienced anything like that, but I have felt pain, aching pain, and I'm so sorry that you have to go through this. Sometimes I imagine my life as the most beautiful fairy tale, and I can't figure out what to do when it doesn't work out. But once it's warmer outside, then I'm sure things will start to feel better. I always feel like going to a church when something sad happens as well, my mother has a shrine in her bedroom for the child she lost. Anyway, I am thinking of you and sending you as much hope and love as I can. My heart goes out to you. My husband and I are trying to have a child without any luck and although I can't fathom your situation I know how delicate and heartbreaking these matter are. Best wishes for happier days ahead. I am so sorry for your loss. I had a stillbirth in 2012, I think about it everyday but I promise you it will get easier. I now have a happy, healthy 4 month old little boy. I don't wish to tell you this to rub it in your face, but wish for it to give you some hope for the future. My deepest sympathy for your loss. Please know that my heart goes out to you and Geoff. Sending you much love and strength, Anabela. I'm so sorry that you're experiencing this. I have experienced a miscarriage too, and have shared all the thoughts you mention here (you are not alone). It seemed like the ultimate betrayal from my own body. I wish you much healing, and I hope your hopes and daydreams return soon as well. It's not an easy healing process. I now have an 8 month old son, and I admit the pregnancy with him was peppered with more nervousness, but his absolute perfection makes all the waiting and emotions worthwhile. Feel better. I'm so sorry, Anabela! That's such a devastating thing to experience and my heart goes out to you and Geoff. Just let yourself feel all these horrible, gut-wrenching feelings now and, eventually, they will make room for better ones. all my love to you and Geoff. I know it's so hard not to get ahead of ourselves when you get good news, and being terrified of the possibilities. I think you're incredibly brave for sharing with everyone, because you will know that you're not alone, and by sharing, other women will know that they're not alone. I'm sending you both healing thoughts. Your future is full of hope. Sometimes nothing helps but knowing you are loved. my heart is breaking for you & i'm just so terribly sorry. so, so sorry. You are the best woman ever, dear Anabela. This post made me cry. I send love to you and Geoff and hope that this cold January ends and that the next months will bring future joy to you both. also wanted to say that I am so sorry for your loss. sending prayers and healing thoughts your way. xoxo, so much love to you both! I got this in the mail this morning from a friend, and I thought I'd pass it along to you. I am living on a planet where the silk dresses of Renaissance women rustled, where people suffered in plagues, where Mozart sat to play, where sap runs in the spring, where children are caught in crossfire, where golds and silvers flint from rock, where religion shines its light only to loose its way, where people stop to reach a hand to help each other to cross, where much is known about the life of an ant, where the star called sun shows itself differently at every hour, where people get so bruised and confused they will kill each other, where baobabs grow into impossible shapes with trunks that tell stories to hands, where rivers run wide and green with terrible hidden currants, where you rise in the morning and feel your own arms with your own hands, where lovers' hearts swell with the certain knowledge that only they are the ones, where viruses are seen under the insistent eye of the microscope, and the birth of stars is witnessed through the lens of the telescope, where caterpillars crawl and skyscrapers are erected because of the blue line on the blueprint. I am saying that all of this, all of these things are the telling songs of the wider life, and I am listening with gratitude and I am listening for as long as I can and I am listening with all of my might. I am very sorry for your loss, and I hope that there is a lot of love and happiness waiting for you in 2014. Thank you for sharing your experience. I believe it helps other women like me immensely who are just starting to think about having a baby and haven't necesarily heard many other misscariage stories from people close to them for one reason or another. It helps to have someone ground your thoughts, as it can be far to easy to focus on all the FB pics of baby photoshoots and showers and forget that things might not go smoothly.Your remark about not getting ahead of yourself and buying clothes and bears hit home because that's where I am - I've managed to buy only one print. But I think those items can be a sign of hope too, and hope is always a good thing. Sorry for your loss, wishing you much brighter and warmer days ahead. Sending you many positive thoughts. my friend anne parker sent me this post after reading what i wrote about my miscarriage 2 weeks ago... she wanted to comfort me, and it did. i'm so sorry for your loss, but sometimes it helps to know you're not alone. if i were still catholic, i'd light a candle for you too. lots & lots of love. this is the first time i have commented on your blog just to tell you that you are certainly not alone. it is sad when you speak openly to women about this and find out how many have experienced the same. heartbreaking. i have suffered 2 and they have changed me... just as much as a successful pregnancy and becoming a mother has changed me. when you are ready, don't be afraid to try again. it took me a year after my last one to contemplate it. your raw honesty has touched me so much. thinking of you. I am so sorry for your loss. I hope these words give you and your husband some comfort. Sending you all of the good vibes in the world. I promise to light a candle for you all the way in Chicago. <3 Thank you for your bravery and your honesty. This too shall pass. I have long read your blog but I have never commented. But I wanted to pass on my heartfelt condolences for your loss. I cannot imagine what it must feel like. I hope your heart starts healing and you and your husband find solace in each other. Anabela, I'm so sorry for your loss, but I too thank you for sharing this. Please know that even though the world is dark now, there is so much light to come for you and Geoff. Holding both of you in my heart. As others have said, I'm so so sorry for your loss. I also suffered a miscarriage just over a year ago on new year's eve, and was amazed by the devastation and depression it sunk me in for months. As you said, it was the loss of a future I'd polished and held close, and that comfort stripped away was more painful than I could have ever anticipated. I also was amazed by the physical pain as well, something which isn't talked about and seems illegitimate in some way when it is for no purpose and there is nothing at the end to mark it or show for it. I'm tearful reading your post because it is so brave and finding language so honest and bare is more than I could have done at the time. I think I would have found it comforting to know that, at least for me, part of the emotional pain, I believe, is hormonal. Your body has been through a trauma and is alien to the way you normally feel. You will feel better than this. I also think I would have been comforted to know that you can still be a parent. Miscarriages are so common and so silent and for most women who suffer from them, there is a happy baby at the end. Our baby girl is due on Thursday, and while this pregnancy has been frightening because of our previous loss, it is also that much more precious. I am sure you will have the same. Let yourself be sad and don't judge yourself for it, and thank you for finding the language to speak it. I think you help others so much when you do. I don't know you, but I am a woman who wants children, and I think, in a way, that means we do know each other. And know that I am sending you a little hug wrapped in a prayer across time and space. Thanks for sharing your story. I am so sorry for your loss. I haven't been through this myself but I imagine that your words will help others who have suffered or will suffer from miscarriages. Lots of love to you and your family. I'm so, so sorry for your loss. Thank you for sharing this. as my husband and i begin to talk about "starting to try", there are somany things that can happen. what scares me even more, is what if i don't get pregnant... or what if i can't. this reality scares the crap outta me, and so many women. also, never apologize for spewing your feelings on here. it's much more important than knowing what the hottest products are. I will never stop wondering who that little one would have been. But were it not for that early loss I would not have my daughter, conceived just a short while later. She is my light. While pregnant with her I couldn't bond or get excited. I knew that I wouldn't be able to until I had a healthy baby in my arms. I'm now pregnant with my second and the anxiety isn't quite as acute, though it's still very much present. I wish you comfort and strength, and send you love and hugs. There is always hope for a happy future. Thank you for your honesty. Oh, Anabela. I've been thinking about you constantly since I read this last night. I am so incredibly sorry. I hope that you and Geoff are able to find peace, eventually. As a bit of an aside, what a heartbreakingly beautiful piece of writing this is. It means a lot to me, and I suspect it will mean a lot to many people in need of healing. Mostly, I hope that it was able to bring you a tiny bit of catharsis. Sending you all the love in the world. Through this darkness, there will come light. You're not alone. I'm sososo sorry to read this. I hope you are well and I'll keep you and Geoff in my prayers. Hi Anabela, I'm so sorry that happened to you too. I experienced my first miscarriage this fall. It was an incredibly difficult experience. It was far more painful emotionally and physically as well. Even though I do already have a son, losing the life inside you that you had so much hope and love for already is a difficult thing no matter what. I just wanted you to know you're not alone. Give yourself time to grieve in this season. I hope that this spring will bring with it a fresh start and new hope for a family. Love and warmth and light to you! Thinking of you, you lovely and gentle and smart cookie. I've been reading your blog for quite some time now and I know that words are mostly useless at a time like this, but I just wanted you to know how sorry I am to hear of your loss. Your family will be in my prayers and I will be sure to request that prayers be said for your family at Mass. I will light that candle for you, too! Know that you are not alone in this and that so many people are sending their warm thoughts your way. Your sweet little angel is with God in Heaven now--take comfort in that. Oh, Anabela, I'm sending so much love your way. I read your blog post this morning and I've been thinking of you all day. It's difficult to know the right words to say at a time like this, but my hope for you is that you heal completely. I read your blog always but I never comment, until today. Thank you for sharing. Be strong and well. I'm going to light my candle for you. Ah, my heart aches for you. A lot of us out here have had similar experiences, and even while that's some cold comfort, maybe it will help you feel less alone. My heart is breaking for you hearing your sadness. I know that words cannot mend the pain you are feeling, but know that you are in my thoughts. I am hoping to have a baby soon, but these are the things I fear the most, and how I would be able to handle the sudden loss of that small little babe. But there is always hope for the future and the happiness that it will hold for you. Thinking of you and sending a million light rays of love and warmth to you, Anabela. Anabela, I'm so sorry for your loss. I feel I need to say something, even if I feel so unable to help you in any way. But I want to tell you how much happiness and beauty you bring to me via your blog and instagram and work and everything. Your world (the part of it I see via internet, that is) is often a space I escape to when I'm feeling low. I want you to know that. You seem like a wonderful person and I wish you and Geoff all the happiness in the world! Thank you for your bravery. I feel so much for you and Geoff. Biggest hugs and hearts from me right now. I am so sorry to hear of your loss. Thoughts with you and your husband. You have helped so many by sharing this. My love and prayers are with you. There is nothing new in my comment, but nonetheless I still want to thank you. A friend recently went through the same experience and when we both acknowledged that this, unfortunately, happens all the time, she then went to say "but nobody talks about it." So thank you for talking about it. I too experienced a miscarriage back in 2012. Thank you so much for sharing this. I truly can't thank you enough. Lots of love and warmth to you and Geoff. It must have been difficult but thanks for sharing something so personal with us. Our hearts are with you. The year has just started and like you said, the best part of the year has yet to come! Don't be guilty as i'm sure the baby knew you had so much love for him/her. Take care sweetheart! You are great! May you and Geoff be in Peace as much as you can be in such a trying time. Thank you so much for sharing, no one talks about this and it's so important to know that you are not alone. I'm so sorry to hear about your loss. sending love and light your way. My friend Laurie forwarded me your posting today as I am going through something quite similar (9 weeks pregnant, D & C scheduled for next week as my baby doesn't have a heartbeat) - thank you for sharing your story, I feel a little bit better just reading it. All the best to you and your husband. no words or sense to make of these events. i had my first in early september, the whole ten months i felt desperate to no end to keep her and keep her safe. nobody really talks about these things that are called 'complications', yet there are so many. why can't we talk about it/hear about it more? why is it so taboo? even the things that happen during and after pregnancy. it all needs to be talked about more. so good on you for sharing. it's what every woman who wants to get pregnant or is pregnant is thinking. constantly. so keep talking. I am a fairly new reader of yours and just stumbled on this post. I am so sorry to hear about your loss. Much love to you and Geoff. I've actually never read your blog before but I just happened to stumble upon your blog tonight. I'm sorry for your loss. As strange as it may seem, I always believe that everything happens for a reason even things like this. All my life I have been preparing myself for all the feelings that are you talking about here. Fertility issues are very common in my family yet, like you mentioned, I'm sure I will never be fully prepared if it does happen to me one day. But, like I said, I think everything happens for a reason. Before my mother was born, my Grama lost her son while giving birth. What seemed absolutely horrible at the time was one of the only reasons my grandparents tried again and had my mother. Years later my mom had a miscarriage 6 months before finding out she was pregnant with me. So really the only reason I'm here today is because of those two events. It may be an odd way to look at it but just think about what the future can hold for both of you. I'm sure there is a reason you went through this and just look forward to finding out what that is someday!